Whoops! Maybe you were looking for Amazing? 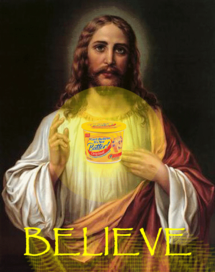 ...and on the 8th day, God said, let there be butter. And it was good. Butter comes from the oil extracted straight from the nut of the western African Butter Tree fruit; churned by the hands of skilled craftsman into a solid golden substance that can best be described in one word: Delicious. Although when applied (consumed or otherwise used) in large quantities it can make one incredibly obese and/or disgustingly oily, butter is considered by many Southern cooking enthusiasts to be the best thing since sliced bread, Texas toast, and dancing midgets. The story behind butter is a fascinating, inspirational tale of worship, sacrifice, and most importantly, lemon poppyseed muffins. If you were to believe everything you read or hear in the media, you’d think that the pat of butter on your baked potato would take an immediate detour from your stomach and head straight to your aorta. Yet recent scientific studies show that butter's bad reputation is actually quite undeserved. It is important to remember that every cell in our body needs fat, and butter can be a cornerstone of good health. Our brain and hormones rely on butter to function. It supports our immune system, fights disease, and may even hold the cure to cancer. Butter promotes clear skin and healthy hair, regulates our digestive system, and leaves us feeling sated after a meal. It is the body’s preferred fuel, providing us with more than twice the amount of energy as the same quantity of carbohydrates and protein. Butter also helps the body absorb nutrients like calcium and the essential vitamins M, I, L, and K.
The word butter comes from the term butterophagous, which means "booty-full" in Greek, and some scholars argue that this same word would serve as inspiration for the hit song Bootylicious. Through the centuries, butter has become so well liked, it can be a sin to eat it on certain days. During the Middle Ages it was one of the foods banned during Lent, so popes and people who liked butter on fast days had to buy special dispensations from the church, and they used the money to build the "Butter Cathedral" of Rome (which later melted during the epic eruption of the Santorini volcano). 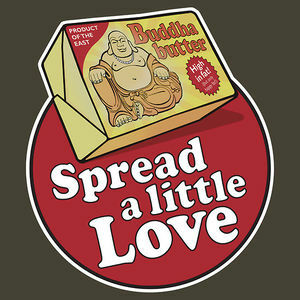 Similar to Western religion's Cheese Jesus, Eastern religion worshippers have the sacred condiment Buddha Butter. The ancient Hebrews referred to butter throughout the Old Testament, making the Bible the first major published documentation of the art of butter-making. Naturally, one would presume that in four thousand years there would have been considerable improvement in the manufacture of butter, although in reality it has remained unchanged for centuries. Butter is made by churning, plain and simple, and if you need to know more about the butter-making process you should probably go back to Wikipedia. "Goddess of wine," "elixer of immortality;"
Provided by the holiest nut on earth. We will proclaim the name of Butter! Spewing, the fire loves them and is satisfied. Who the hell puts butter on a...Wait a minute...This article is about butter! You goddamn hack artists, isn't this picture supposed to be on the mustard page? Anti-wrinkle and stretch mark cream on the face and body. Softening hands, elbows, the soles of the feet, and fortifying cuticles and nails. Shoved directly into the nostrils as a nasal decongestant. As a replacement for ice cream in the bedroom. As early as 1845, some idiotic scientists that can't be right stated that butter cannot be healthy in excess, contrary to what many believed. Claiming it had lethal trans fat in it, they said it could clog arteries, make you fat, and make you look like Oprah Winfrey. This test was proven in the 1847 Butter Crisis, when 100 people fed a typical butter diet all began getting fat and looking like mini-Winfreys within 4 months. Though doctors worldwide said these symptoms were temporary, a week later, 72 out of those 100 people died of heart attacks. The British government banned the typical butter rations served at most stores (50 pounds of butter per pack), reducing them to 10 oz. cans of butter that could only be sold one can per person per month. Famed writer and philosopher Charles Darwin, author of the well-known book On the Origin of Feces, wrote a new book Butterus Fatalis Maximus: Butter and its Lethal Deception. The book was an instant success world-wide, and butter was either severely restricted or outright banned in almost every country, except for Assyria, 'cause Assyria's cool. ↑ "There is no such thing as too much butter" was a conspiracy popularized by Paula Dean as an excuse for her to eat whole sticks of the stuff. ↑ To dream of eating fresh, golden butter, is a sign of good health and plans well carried out; it will bring unto you possessions, wealth and knowledge. ↑ Warming up butter by placing between the palms will result in a creamier and smoother application - ENJOY! ↑ How much do you love butter? - Play the popular game.